That was no ordinary Inauguration. That was no ordinary public experience. A threshold has been crossed. Inauguration Day was an extraordinary experience of collective desire, longing that was larger than any individual’s (especially President Obama’s), larger than a political party’s ideology, larger than media spin. Something happened. It was an outpouring. The sign of Aquarius, the Water Bearer shows a figure pouring out a flood from the heavens. We felt that flood as the Sun entered Aquarius on Inauguration day. The planet of collective experience, Neptune, has been in Aquarius since 1998. The planet that rules change, Uranus, has been in Pisces since 2003. 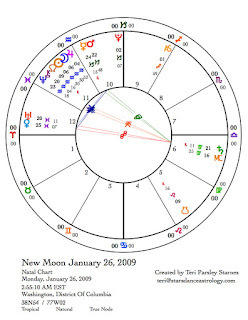 The Inauguration was a Neptune in Aquarius experience, and it was a Uranus in Pisces experience. Both of these planets are in mutual reception; that means they are in each other’s home signs. They strengthen each other. Both of these planets have been poised for some time to release this flood of readiness for change and collective hope. The tipping point apparently has arrived. Perhaps Jupiter entering into Aquarius on January 5th was the key. Obama’s natal Jupiter is also in Aquarius and happens to be at the same degree as Jupiter in the Inauguration chart. I don’t believe this means he is The One. But I do think there is strong temptation to believe it. When Jupiter expands too much, it is helpful to reground through Saturn, the ultimate realist. Saturn plays a role in all this as well. That story later. Aquarius pours it out at the New Moon. The New Moon this month is a Solar Eclipse in Aquarius. The chart shows a cluster of planets in Aquarius: Neptune, Chiron, Jupiter, Sun and Moon. Eclipses are unpredictable in that we don’t know where we we’ll be after the light returns. I am paying attention to a familiar arc of ecstatic experience. First, Neptune unleashes its ocean of god-knowing, then events and choices don’t match up to the expectations of my new consciousness. Disappointment, cynicism and despair follow. What if our new post-Inauguration consciousness included a different way to navigate through disappointment? Disappointment is inevitable. We are chaotic and imperfect humans, thank goodness. But do we have to sink into nasty responses to our disappointment? My own disappointments in life have been bitterer when I surrendered my own responsibility to create and sustain the new visions I longed for. When the light returns from this solar eclipse, where will you be standing? What work will you be engaged in to create the change you hope for? What I learned from the collective outpouring of hope was that I do play a part in how we move forward. Each of us plays a part. One Aquarian ideal is that it takes organized people and communities to make change happen. One Aquarian paradox is that sometimes one individual has to go against the collective in order to wake those communities up. All of this energy is part of our times. Are you experiencing an eclipse in the same old ways of doing business in your communities? What new ways are opening up? Another response to collective ecstasy is skepticism and pragmatism—an impulse to stay away from the Kool-Aid. Saturn in Virgo, opposing Uranus in Pisces since the election, and Pluto in Capricorn are worthy allies of this approach. The opposition between Uranus and Saturn becomes exact again this month. What details need to be gone over in your own revolutions? Saturn invites us to take the feeling of unity, dismantle it, analyze it, and perfect it. Virgo reminds Pisces that ideals are grounded in service. Pluto continues to unleash Capricorn’s potential. We now know that financial systems need better oversight. How do we make sure that happens? The Full Moon is a Lunar Eclipse on February 9. The light goes out of the Leo Moon. Leo, the opposing sign to Aquarius, provides needed balance to all that Aquarius energy. Leo is about the individual’s gifts to the collective. Obama’s Sun is in Leo. The inquiry for Leo is, How do I share my gifts with the collective? Are my gifts valued? What is my worth? Right now, President Obama is an excellent example of how each of us can create excitement, energy, and inspiration by sharing our inner spark. The chart for the Full Moon shows a close gathering of the Sun, Moon, Chiron, and Neptune. Chiron is an archetype of shamanic initiation. So soon after experiencing collective euphoria, we may now experience collective grief or wounding. Chiron directs us to make our wounds sacred by serving the wholeness of others. Later this summer, Jupiter, Chiron and Neptune come together in a near triple conjunction. The tone of this Full Moon may give us insight into that coming season. Venus retrograde in Aries. Later this month, Venus’ role shifts from the muse for dreams to the muse for action. Venus will station retrograde in Aries in March. This month, Venus enters the shadow zone of the zodiac where she will retrograde back. Venus in Aries will challenge our relationships. This Venus journey will be about staying true to our selves in the service of beauty. Important dates in our story. February 1 Mercury stations direct (21° Capricorn) Thoughts, plans and communications move forward. February 2 Venus enters Aries and the retrograde shadow. Venus stations retrograde on March 6 at 15° Aries. February 5 Venus (2°Aries) square Pluto (2°Capricorn) Gathering and confronting power.